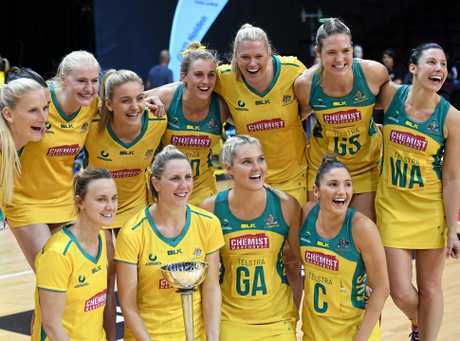 THE Australian Diamonds have taken out the Constellation Cup for the fourth straight year, edging the Silver Ferns 49-45 in a heated finale in Invercargill last night. The Diamonds raced out to a four-goal lead at the first break, as the Ferns struggled to find their rhythm in attack. And that proved to be the difference in the end as the visitors repelled desperate fightbacks from the Ferns. The Australians had the silverware all but locked away for another year heading into the final clash, with the Ferns needing to win by 22 goals or more to claim the title for just the second time in seven years. Despite their commanding position, the Diamonds played like a team still fighting for the series. They were brutal in defence - at times excessively so - swift and clinical through the midcourt, and deadly accurate on goal. Their unwavering application through the court reflected their disappointment at how they finished the 2015 series. The Australians looked to have had the title comfortably sewn up heading into last year's finale, but they were upstaged 58-47 by a determined New Zealand side, in what was Waimarama Taumaunu's last game in charge. The 11-goal win was not enough to wrest the Cup away from Australia, but the Diamonds were nevertheless bitterly disappointed to head into their summer break on the back of one of their worst losses in years. It's a feeling Lisa Alexander and her side were determined they would not experience again. The Ferns, disappointed with their lapse in intensity in last weekend's 12-goal loss in Auckland after doing so well to fight their way back into the series with a 53-51 win in game two in Tasmania, wanted to finish with a performance they were proud of. They also had a rather large monkey to shake from their backs having not beaten Australia on New Zealand soil in more than three years. But they could not channel that desperation into a cohesive and consistent performance for long enough stretches. They had their moments, however, with the Ferns particularly impressive on defence, limiting the free-scoring Australians, led by the dominant Caitlin Bassett, to under 50 goals for the first time this season. Anna Harrison and Laura Langman were once again influential in defence. With Langman opting to make the move to the Australian league next year, she will not be eligible to represent the Ferns in 2017, meaning last night's match marked the end of an incredible 141 consecutive Tests for New Zealand. The Ferns struggled to find their feet early in the match as they found themselves immediately smothered by the Australian defence. They looked slick through the court, but they had trouble executing their final pass into the circle with Bailey Mes wearing a green and gold cloak otherwise known as Sharni Layton.